In this part I will show you how to create your own first blog. In previous part you had to find your niche, topic of your blog. If you have found any, try to write list of words that best describe your topic. If you didn’t find one, try to think about your topic now, or simply create your personal diary blog. 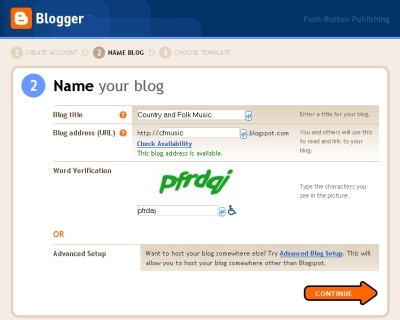 As host for our blog we use the most used free host for blogs Blogger.com. Blogger is owned by Google company. We will use much more tools from Google and you will need to register on Google and create your Google account. 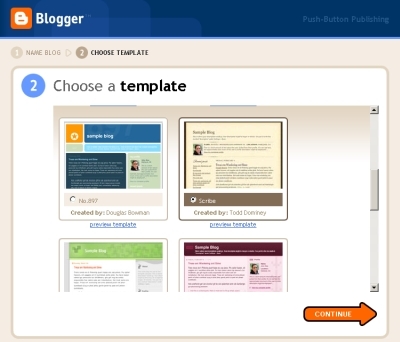 If you have Google account log in it on Blogger on top right side of page. Otherwise you will create one on Blogger pages. Press button Create your blog now. If you don’t have account, you will create one on first page. Now it is time to use your list of words for your niche. If you want to create your personal diary blog try to use your name or your nickname for Blog Address (URL) field. Otherwise you try to find most simple word or words combination from your list, write it to field and click on Check Availability link to check if you can use this URL. Now you can fill Blog Title field. It is also good to use words from your list. Title of blog it is possible to change also in future. At last fill Word Verification field and press button Continue. Now you have your own blog and you can create your posts to blog. But there is a long way before you. You can prepare some posts for your topic straight in your blog itself or you can only write it simply in Microsoft Word editor. In next post I will show you how to write your posts in blog. 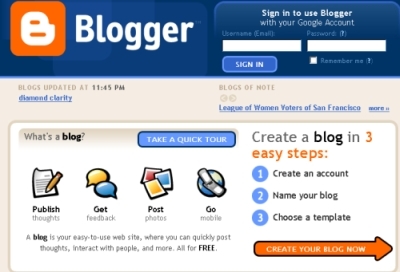 I wrote you in this post how to create blog in easy and free way. There are also other choices. You can register your own domain and pay hosting company to host your domain. This is much more complicated process, and I will not write it here in this post. In that case you will spend to 10 USD/year to domain registration and about 100 USD/year on hosting. I can recommend you Namecheap.com for domain registration and Hostgator.com for hosting. I am using them and I am satisfied with them. A niche market is a focused targetable portion (subset) of a market sector. A machine or virtual host on the Internet; the name of a domain (the “domain name”) can be confused with the domain itself. A web hosting service is a type of Internet hosting service that allows individuals and organizations to provide their own websites accessible via the World Wide Web. Web hosts are companies that provide space on a server they own for use by their clients as well as providing Internet connectivity. This entry was posted in Blogs, Make Money Online and tagged blog, money. Bookmark the permalink.